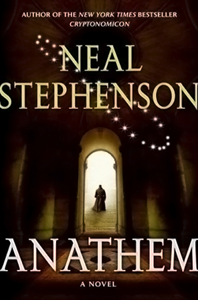 1) Pat lent me his fresh new copy of Neal Stephenson's Anathem today. I'm pretty excited about it after reading the dust-jacket notes, so I am passing over to him my as-yet-unread copy of The Power and putting off The Forever War until after I'm done with Anathem. I've read three other Stephenson books: Snow Crash, The Diamond Age and Cryptonomicon. I really enjoyed all of them, the first two perhaps a bit more than the last. The Diamond Age is, in fact, stunning and downright gorgeous, so I have high hopes for this newest one. I have not, however, read the thick tomes of Stephenson's Baroque Cycle: I just haven't been ready to tackle that one. 2) It seems like it was just a couple days ago that I was looking at my relatively empty in-box and starting to wonder if I was still getting story submissions to M-Brane at a sufficient rate. Now, today, after coming out of the fog of a particularly long and arduous stretch of days at the day job, I see that I have a new pile of unanswered submissions that I had better get to work on. I wouldn't call it a "slush pile," and I don't really like that common editor term that much because it seems to imply that the submissions are some kind of hopeless, unwelcome mass of documents that needs to be slogged through drearily. It's not like that at all. But I need to stay on top of it if I want to maintain my standard of pretty rapid response time. Speaking of response time, I noticed that some M-Brane writers have been taking the time to report their responses to Duotrope, which I appreciate. I think the average response time as stated for me on Duotrope is pretty accurate. Though the statistics on there also indicate that I have whopping seventy percent acceptance rate, which is not close to accurate--I suppose more people feel like reporting their acceptances than their rejections, which I can understand.